Anyone on Purdue's West Lafayette campus who's ever received mail, recycled an unwanted computer, or sent or received a package of any variety has come into contact with Mike Wilkins' handiwork. 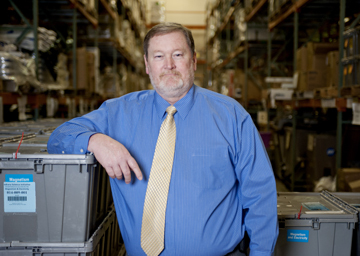 Purdue's director of materials management and distribution, Wilkins is responsible for a plethora of the University's most essential functions. Although he manages many tasks at once, Wilkins still finds time to provide support to his area's customers -- everyone on campus. What operations does your area cover? Materials Management and Distribution covers a whole host of tasks. Some are intra-campus mail service, incoming and outgoing U.S. mail, delivery of parcels and packages, delivery of building materials to building projects, shipping and receiving, warehouse and surplus operations, the University's four storerooms, and a taxi service that takes Physical Facility workers and their tools to and from University sites. We're also in our second year of involvement with the I-STEM program, which is a statewide, science-learning program that has been approved by the Indiana Department of Education. As part of that program, we assemble 33 different hands-on science kits that are then sent out to about 135 schools across the state. So far, the program has served about 70,000 students in grades kindergarten through eighth. What are in these kits, and what is their purpose? The kits contain materials to conduct several kinds of hands-on science learning experiments. Some of the kits help students learn about Earth's changing surfaces, or forensics, or air and water, or other related topics. We keep all the kits' materials in the Materials Management Distribution Center, where we pack them up appropriately and send them to partner schools. I-STEM is part of the Indiana Science Initiative, and its goal is to fully engage and excite students about science using the kits' hands-on experiments. Last year, seven of my staff members and I got to see firsthand how the kits are used in the classroom. We went to Benton Central Junior-Senior High School and we got to watch as the students interacted with each other using these kits. It was just amazing to see every child engage with the lesson -- they loved the experiments, because they helped the students see cause-and-effect scientific processes. Just to see every child smiling and happy about learning was very rewarding. It's also great to know that Purdue has provided this kind of opportunity to kids, some of whom might otherwise struggle to learn and be engaged. How do you and your staff members provide customer service to the entire University? For us, the key is constant communication among ourselves, because it allows us to stay at the forefront of our customers' needs and of the technology that can help us assist them. Personally, I help our staff by providing support whenever they have a question about a customer or a product. I also provide my own customer support to those who contact me with questions. I never think twice about answering even the smallest question, whether it's from a staff member or a customer, or getting out on the floor and filling orders with the rest of the staff. Doing these things, I think, helps my staff see me as one of them. It also helps me earn their trust so we can stay cohesive as a unit. How are you collaborating with faculty members to help students learn? We are engaged with Edie Schmidt, professor of industrial technology and associate dean for research, on a project that is helping provide practical, real-world experience to 34 undergraduate students. Essentially, we are showing the students our existing supply-chain models, and they are completing projects to determine ways to improve, enhance or change those models. At the end of this month, they'll present their projects here in the distribution center. The collaboration is great because they're getting experience while we're getting suggestions from folks who are looking at our operations with fresh eyes. Another project we're working on involves Fu Zhao, assistant professor of mechanical engineering, who is teaching some of his students about our LCD monitor-recycling program. In turn, those students will look at ways to improve that program. So that's another example of us providing teaching opportunities while receiving great suggestions from our students. Our operations are award-winning -- last year alone, we won the inaugural electronics division in the nationwide Recyclemania contest, the NACAS Innovative Achievement in Auxiliary Services Award, and the APPA Effective and Innovative Practices Award for our Warehouse and Surplus sustainability programs. We're excited about the ways we have been able and will continue to maintain our top-notch operations while providing robust opportunities for students to learn.